The war in Vietnam was not quite over. C 2/5 Cav fought its last firefight, and suffered the loss of its last casualty. While working out of FSB Mace, C 2/5 Cav received a mission to find and destroy the headquarters of the NVA 33rd Regiment (Source: Anatomy of a Division - Stanton) near The Elbow, an area so called because it was near a bend in the the old colonial Route 333 where it turned from a north-south to a northwesterly direction. The operation would be carried out by the 1st Platoon under LT John McCorkle, and 2nd Platoon, under LT Jim Ratliff. 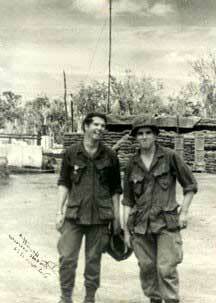 3rd Platoon, under LT Tom Thomas, would stay behind on firebase security. The assault was to have taken place during the morning of January 2nd, but for unknown reasons, the helicopters were delayed, and did not arrive until late in the afternoon. Even then, the assault did not take place until early evening. The sun had set by the time the assault was completed. Because the enemy would obviously have seen the helicopters inserting the company, CPT Dolf Carlson made the decision to move away from the LZ into a new defensive position, even though this meant a night movement. After settling in about 10 PM, they heard heavy automatic weapons, AK-47, and mortar fire from the direction of the LZ. By mid-day, McCorkle's 1st Platoon was sent north to recon. 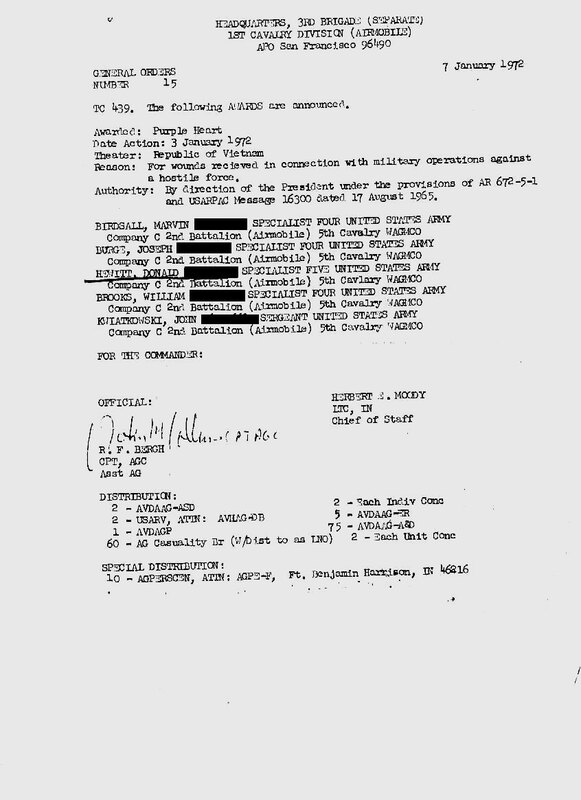 Finding nothing, Ratliff's 2nd Platoon was sent west. Soon they were in heavy contact and were pinned down with two seriously wounded. Immediately, 1st Platoon and company headquarters were on the move. Though they linked up with the 2nd Platoon, enemy fire was so heavy that a number of Medevac birds were shot down. Unable to evacuate the wounded, the company returned to their previous perimeter - through enemy fire and heavy vegetation. By sundown, the dead and seriously wounded had been evacuated using a jungle penetrator, all under the cover of Cav gunships. Pre-planned artillery defensive fires continued through the night, but the NVA did not attack again. January 4th, and the company marched to the LZ. There the remainder of the wounded were evacuated, and the company was reinforced by Thomas' 3rd Platoon. C 2/5 Cav swept the area of the contact. Finding evidence of great destruction, they were unable to ascertain how many NVA they had fought, or how many they had killed. Wounded in that fight were 1LT James Ratliff, SP4 Earl Vanalist, SGT David "Drops" Sprinkle, and SP4 Jimmy Hernandez. (General Order 14 dated 7 January 1972. Also awarded the Purple Heart were SP4 Marvin Birdsall, SP4 Joseph Burge, SP5 Medic Donald Hewett (now known as Kuzriel Mier) , SP4 William Brooks, and SGT John Kwiatkowski. (General Order 15 dated 7 January 1972. Also awarded the Purple Heart were SSG Roy Baxley, SGT Thomas Donahue, SP4 William Brandt, SP4 Timothy Reilley, PFC Phillip Cremins, PFC John Mroz, PFC Thomas Neurauter, PFC Robert Steadman, and PFC Sam Washington (General Order 156 dated 3 February). 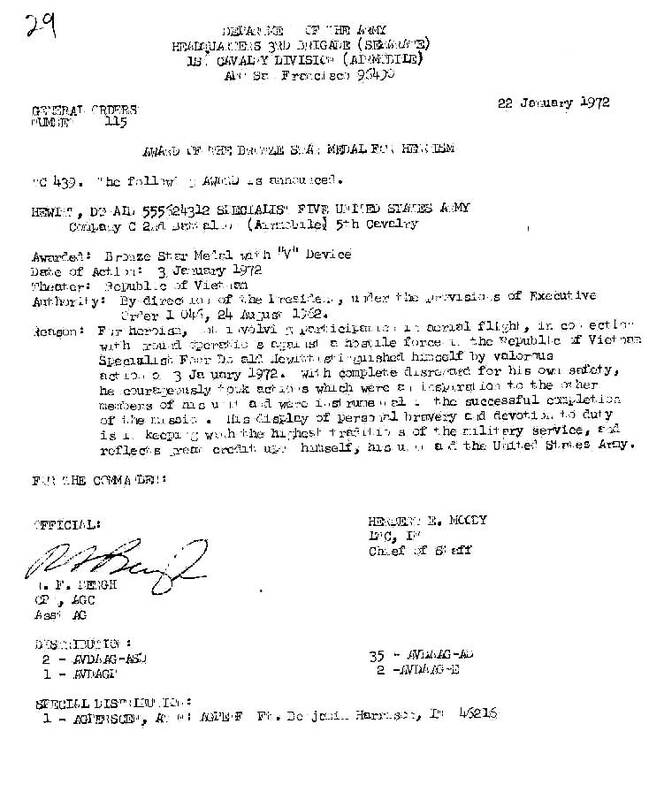 SGT David Sprinkle was also awarded the Silver Star for this action, medic SP5 Donald Hewett the Bronze Star with "V" Device, and PFC Phillip Cremins the Army Commendation medal with "V" Device. Please read Dolf Carlson's recollection of this fire fight in his story of the last days of the company in Vietnam. The company was visited by the Commanding General of the 3rd Brigade, 1st Cavalry Division, for the purpose of awarding medals. Right is SGT John Kwiatkowski and SP5 Donald Hewett wearing their new decorations. Early in the war, the Commanding Officer instituted a policy of making awards as soon after a firefight as was possible. They were called "Impact Awards", and were presented before all the paperwork had been done. At right is the slip of paper given to Donald Hewett for his Bronze Star. Later, he received the citation after it had gone through channels.